Low-cost airline Norwegian has taken another significant step in its expansion by opening its new UK headquarters by London Gatwick Airport. 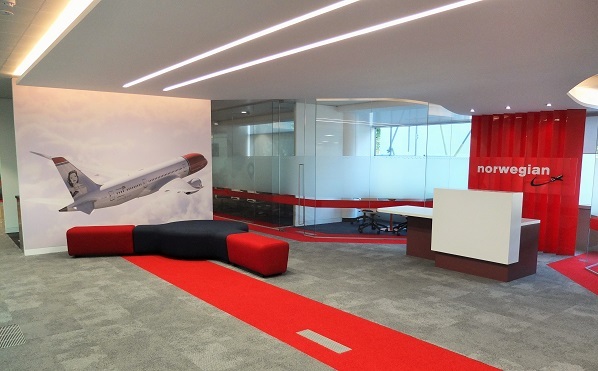 Norwegian’s new office is the airline’s first permanent workspace outside of Norway and home to Norwegian staff based in the UK. Key staff in flight operations, training, technical, safety and compliance, communications, marketing and sales in the UK are now based at the headquarters. The low-cost airline is continuing to provide affordable flights to the UK by launching seven new routes from Gatwick, Edinburgh and Manchester this year alone. Asgeir Nyseth, chief executive, Norwegian UK, said: “This is an exciting new milestone in Norwegian’s pursuit of substantial growth across the UK. “Our new UK headquarters symbolises our commitment to this hugely important strategic market, and it allows us to grow steadily in an engaging work environment. Norwegian was granted a UK Operating Licence and has applied for a Foreign Carrier permit with the US department of transportation, which would allow the airline to combine services to the US with long-haul flights to global destinations including Asia, Africa and South America.